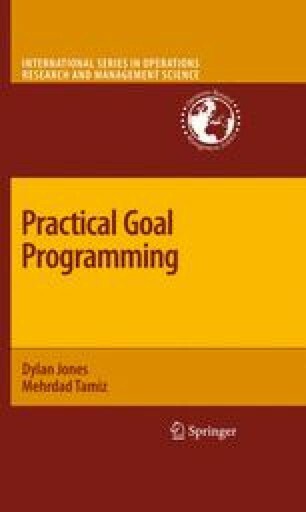 As discussed in Chapter 1, the main philosophy underlying goal programming is the Simonian theory of satisficing (Simon, 1957). This philosophy is implemented by the selection of a set of target levels by the decision maker to be achieved as closely as possible. However, goal programming, arising from the field of optimisation, also encompasses elements from the optimising philosophy. The solution to a goal programming is, mathematically speaking, either a single optimisation or a series of linked optimisations. The similarities and differences between the economic theories of optimising and satisficing are well documented (Byron, 2004).